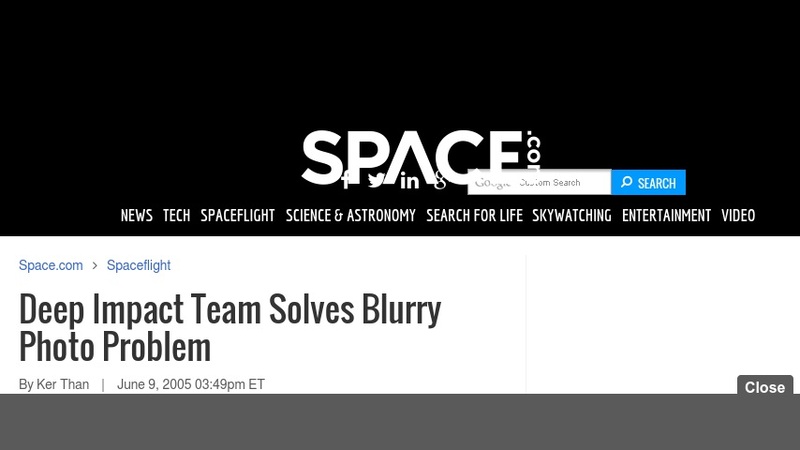 This article from Space.com describes how scientists from NASA's Deep Impact mission intend to fix the spacecraft's blurry vision problem by applying a mathematical process to the images after they have been transmitted to Earth. The author briefly descibes the process, called deconvolution, and discusses some challenges that the researchers will need to address. Readers can also learn more about the Deep Impact mission and its goal of learning about the makeup and nature of the mysterious nucleus of the comet Tempel 1. NASA's Deep Impact mission was designed to uncover a comet's innards by smashing a probe into Tempel 1. After being releases from the Flyby craft, the Impactor will position itself directly in front of the speeding comet for a head on collision. The impact is scheduled to occur at 1:52 a.m. EDT this July 4, 2005.